This site is here to thank the wonderful people who have helped me much with building this site and making it what it is right now. My name is shiricki, and I have created this website with all my love for the House of Mirth. 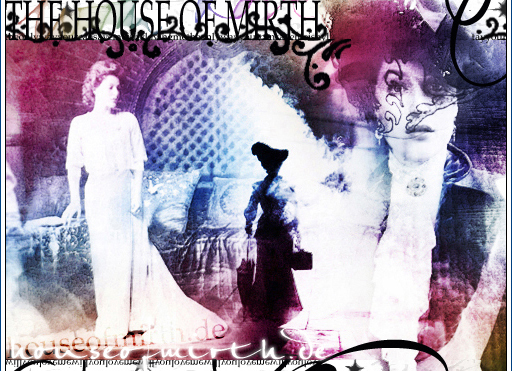 houseofmirth.de is one of plenty websites I am owning. This site is pretty much complete, but I still love working for it. The movie means so much to me that I had to create this site. I hope you liked your stay. If you want to see more of my works, visit my personal site angelic-trust.net. thank you very much. Danke für deine unermütliche Arbeit :p (als ob du noch nicht genug zu tun hättest mit deiner Seite, dem Gremium und FanFiction, nein, du arbeitest auch noch an Übersetzungen!) Von Workaholic zu Workaholic: THANKX!!! Thankx a lot for joining. Auch du bist noch nicht augelastet genug und hast dich deshalb dem Translation-Team angeschlossen. Weise Entscheidung :) ! Auch dir danke ich an dieser Stelle für die Übersetzungen. Wir kennen uns zwar kaum, doch weiß ich deine Arbeit sehr zu schätzen!!! Thankx so much for your work. You're really one of the best artists I know!!! Keep up the wonderful work and don't stop to create such great collages! Thankx also so much for permission to use your work! I am really happy to feature such great artists on this site! Thankx Vered for all your collages and also the brushes that everyone loves to use! I think ... I used of them for one of my Lily collages!